An “insightful look at the moral complexity of an untold story,” now on stage in Toronto. Most Canadian history classes, if my experience is any indication, teach very little about African involvement in the first World War – many of those important details tend to get lost under the narrative of Canada coming into its own as a nation. It’s those missing pieces in our knowledge that spurred Zazu Oke and Vince Deiulis of Theatre Nidāna to create Gods Like Us, now playing at the Factory Studio Theatre, in commemoration of the 100th anniversary of the armistice that ended the fighting. 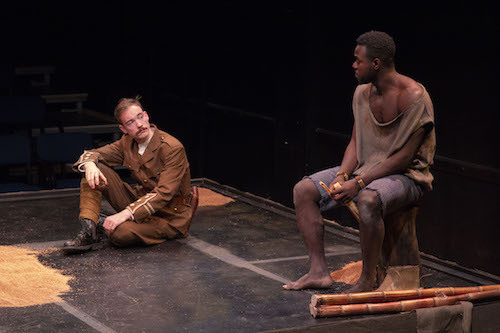 Set in November 1917, the narrative centres on a gradually-growing moral confrontation between a Canadian soldier and the Nigerian yam farmer who is understandably wary of the recruiter’s pitch to join the war effort in East Africa. The farmer has seen the economic and deadly effects of the war on his own community; the Germans, better trading partners than the stingy Allies, don’t seem like the enemy. As well, the racist nature of war service (black men could only serve as “carriers” for white soldiers, and were forbidden from defending their own lives against a white enemy soldier, for which they could be killed by their own regiment) doesn’t make for the best sales pitch. Acknowledging the show’s likely audience, the Canadian soldier is painted as well-meaning and quite sympathetic, at least to begin with. He’s textbook polite, eager, and desperate to be liked, but steeped in a culture of white supremacy and therefore hiding some nastier prejudices underneath. While he presents as quite enlightened for his time, his attempts to connect with the farmer are rebuffed as patronizing: “Thank you for quoting the wisdom of my people back to me,” the farmer says. To his promise that the farmer will be seen as a god for his war service, the farmer shoots back: “Do you think you are gods?” It’s an uncomfortable truth that the soldier seems unwilling to discuss until it – and a weapon – are pointed directly into his face. Adding a layer to the character are moments of shellshock, which I found a little dramatically convenient, but that my guest thought were played quite authentically in their suddenness and disruptive effect. The farmer is also a layered character with depth, though it’s fairly clear early on that he’s meant to have and hold the moral high ground. The actors make good use of the physical space; the studio has been rearranged with a raised stage in the middle of audience on both sides. This enriches the scene where the actors wrestle in a suspenseful, well-choreographed match, making the audience seem like it’s on the sidelines of a ring. They enter through the audience in a fourth-wall-breaking beginning that could be exploited even more throughout the piece. Oke and Deiulis play very well off each other, developing an uneasy rapport that gradually builds in tension. There are, however, a couple of moments that seem slightly under-rehearsed, in particular a long legend about a trickster tortoise figure, which will probably improve over the course of the run. The set (constructed by Erica Causi), props and costume design are all effective, visually and symbolically; piles of dirt hide buried secrets and treasures, sugar cane is efficiently stripped and chewed, and the starched military uniform clearly contrasts with the farmer’s loose, simple clothes. Both men will shed clothing, along with layers of pretense, during the show. Coming in, what had excited me most about the play was its promise of traditional Nigerian music. There is a short segment where Oke sings beautifully, and I wanted to know more about the song and its context. I hoped for more incorporation of music within the play and its sound design, but it was limited to the one song and the pre-show ambiance (composed by Nathan Radke with violin by Mark Whale). With its slim 55-minute runtime, Gods Like Us could probably be expanded, with more dramatic beats and room to breathe. Overall, however, it’s an insightful look at the moral complexity of an untold story that deserves not to be forgotten as we pay our respects to those who served. Gods Like Us plays at the Factory Studio Theatre (125 Bathurst St.) until November 17, 2018. Shows run Tuesday-Saturday at 8:00PM, with Saturday matinees at 2:00PM and a Sunday matinee at 2:00PM on November 11th. Tickets are $35 are can be purchased through the Factory Theatre box office by phone at 416-504-9971, online, in person, or at the door. Thank you for your thoughtful review, Ilana and for joining us at the performance.